1998 Discovering Deserts. New York: McGraw-Hill. Included are many activities and background information for all elementary grades. 2000 My Nature Journal: A Personal Nature Guide for Young People. Lafayette, CA: Pajaro. Children can write and sketch in this easy-to-carry journal. Ideas for journal entries are attractively presented throughout the book. Spiral binding makes it easy to use. 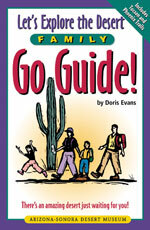 1997 Sonoran Desert A to Z Coloring Book. Phoenix: Donna Atwood Design. Excellent illustrations of desert life are accompanied by informative captions.